remove the ho2 sensor while it is hot. be careful not to expose the ho2 sensor to excessive shock. Do not use an impact wrench when removing or installing the ho2 sensor. 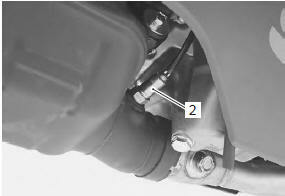 Disconnect the ho2 sensor coupler (1). 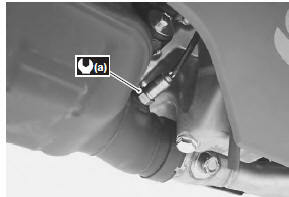 Remove the ho2 sensor (2). Install the ho2 sensor in the reverse order of removal. do not apply oil or other materials to the sensor air hole. Refer to “dtc “c44” (p0130/p0135): ho2 sensor (ho2s) circuit malfunction” in section 1a (page 1a- 103).